Minimum stay requirements: Open year around. There is a two-night minimum. We may be able to accommodate your one-night stay depending on how our reservations fall. For one-night stays, a 100% deposit is required, and we cannot guarantee a specific room. Sleeping accommodations: are for registered guests only. If you wish to bring visitors during the day, please make the proprietors aware of this prior to the arrival of your guest. Please, no more than 2 visitors per guest and no overnight-unregistered guests. Children: The Ellwanger Estate seeks to provide a quiet, restful, and romantic environment best suited for adults. However, accommodations are available for children 8 and older, with well-behaved parents. We will accept children under 8 y/o with total house rental. Additional guest fee for greater than 2 guests in a room, applied at $50/per person/per night- including babies). Pillow Menu is complimentary and is online when making your room reservations. Please DO NOT bring your own pillow from home! We will make every effort to provide a wonderful sleep. Accessibility: Please note that access to your guest rooms requires the use of stairs. Pets: Out of courtesy to our guests with allergies, we can not accommodate pets. This is a drug free establishment: no illegal or recreational substances are permitted on the grounds or in the home at any time. Any person under the influence or known to be in possession on the property will be asked to depart at the proprietor’s discretion. We reserve the right to refuse service to anyone. Firearms are not permitted: on the grounds or in the home at any time. Smoking is not permitted anywhere inside the house or outside on the grounds. We cater to patrons that have allergies and sensitivities to odors and tobacco smoke. All our rooms require ozone as a result of smoking in any room. There will be a $300 charge added to our fee. Our insurance requirements prohibit the use of candles, incense or open flame of any kind in this circa 1880 wood structure. 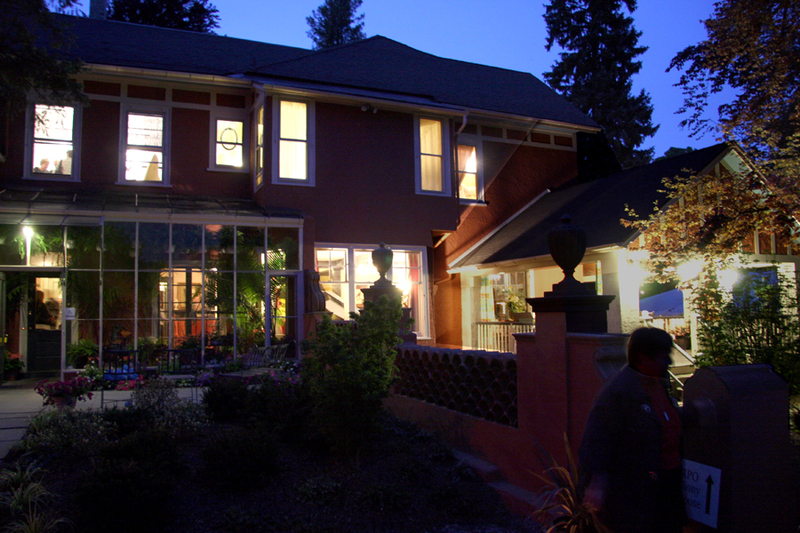 WiFi: The Ellwanger Estate provides complimentary high-speed wireless internet access throughout the B&B. Payment: Yes CHECKS are PREFERRED & APPRECIATED! Also Cash, VISA & MC accepted. Check-In/Out: Guests are invited to check-in daily between the hours of 2:00 to 6:00 pm. Please make your travel plans accordingly. If you anticipate a late arrival (after 6 pm) please call 24 hours ahead to make special arrangements. Check-out is by 11:00 am. Late checkouts are available at times and are $40 per hour or any part of an hour per room. Breakfast: A hot three-course breakfast is served daily in our dining room. Help yourself to fresh, hot strong coffee, tea, cocoa, and juice. Seating times are at 8:30 and 9:00 am. Light fares and Grab & Go breakfasts are available. Please let us know of any dietary restrictions or food dislikes when you make your reservations. Note: Please do not bring in take-out food. Damages and Liabilities: Guests will be charged for damages to B&B property that may have occurred while said guests were having too good of a time, or resulting from negligence, recklessness or misuse. Cosmetic towels are provided for makeup removal and other colorful clean up jobs for your convenience. Cancellations: As a small business, cancellations affect us greatly. When a reservation is made, your room(s) is/are guaranteed for the entire stay, and guests are responsible for the entire balance of nights reserved. Therefore, cancellations made more than 7 days prior to your arrival date will receive a refund minus $35 processing fee. Cancelation less than 7 days from your arrival date will be subjected to a one night charge and $35 processing fee/ per room. Regretfully, there is no refund for early departures, or shortened stays. No shows and early departures will be charged for the full reservation. Shortening of your reservation during the cancellation period is considered a cancellation of that night(s) and the regular cancellation policy applies. Reservations cancelled less than 30 days prior to a stay over major holiday periods or any other special event period (to include all Federal holidays, Lilac fest, peony weekend, Jazz fest, all graduations, L/PGA, and Meloria weekend) are NON REFUNDABLE. Full House rentals require 45 days cancellation notice and have a $200 cancellation fee. Due to the difficulty in rebooking rooms at the last minute, it is necessary for us to enforce this policy. If you have any concerns about having to cancel, we recommend you look into travel insurance. Thank you for your understanding. Gratuities: In response to inquires from our guests, please note that staff members are permitted to accept gratuities. Gratuity recognition is welcome for exceptional service from any of our staff members or service teams. All guest rooms are television free, the library TV is for guest use. At The Ellwanger Estate, it’s important to us that our website is accessible and easy to use for all persons with disabilities. When creating our website, our development team used software tools to identify web accessibility standards as outlined by the World Wide Web Consortium’s Web Content Accessibility Guidelines 2.0 Level AA (WCAG 2.0 AA). While the industry is not operating from approved, regulated legislation, The Ellwanger Estate is committed to our good faith effort to follow the guidelines available. If you have questions, concerns or have discovered an accessibility issue on our site, please contact us by email. Be sure to include specifics and any page where an issue has occurred. We will make every reasonable effort to make the page accessible for you. The building that comprise The Ellwanger Estate B&B was built in 1880. Consistent with the architectural norms of the time, there are many steps within The Ellwanger Estate. As we do not have an elevator at The Ellwanger Estate, some guests with mobility issues may find access challenging. Please count on us to gladly assist you with your bags. If you wish to enjoy breakfast in your room, we are happy to offer room service.